Eric’s done a good job lately of keeping you updated on our family’s situation as it’s been changing almost by the second. But I’ve done a terrible job of keeping you updated on Samuel. Sad day! He’s too cute to be keeping all to ourselves! So this post might be a little scattered, but I promise to add in lots of pictures and a couple random videos to make it worth your while if you make it through :) I’ll apologize in advance though that most of these pictures and videos were taken with our cell phones so they’re not the highest quality. Sam at Eric’s graduation. Isn’t he cute in that suit? So, Sam will be 6 months next Friday. I can’t believe how fast the time has gone! He is extremely wide eyed and curious about everything. I think we’ve decided he can officially crawl, but he still prefers to do more of an army crawl because he can get around the room wicked fast doing so! His favorite thing to play with is anything that has to do with technology (surprise!) He loves grabbing power cords and playing with our cell phones. Lately he gets the biggest kick out of “talking” to people on my phone… which generally means that he’s chewing on my cell phone and pushing buttons while I put his Grandma or Uncle Cody on speaker phone. Yup, Sam definitely takes after his parents in his love for technology! One of the fun things with Sam lately is to see how much he wants to be like the men he sees. He is totally a boys’ boy. He likes any attention, but you can tell that when he gets attention from his dad, or his uncles he LOVES it. He starts showing off all of his cool tricks that he’s learning and wants to be just like them. That goes ten fold for his dad. I think it’s adorable to see how much he is still just totally enamored with Eric (not that I blame him :) ). He also recently got a little doorway jumper that my Uncle Paul and Aunt Stacy are letting us borrow. He has had a blast with it! He loves to jump and stand. He’s starting to climb. I discovered this the other day when we were all waking up in bed and Sam was just crawling around and playing with us. Then he saw the clock on Eric’s nightstand. But since Sam was on the opposite side of Eric from the nightstand I thought it was ok. Nope! He climbed up, and got over Eric to make his way towards the clock. One of the best parts about Sam sleeping with us is seeing him wake up in the morning. When Sam is well rested he wakes up and is very smiley and playful. It is so adorable to see him in the morning. And of course, the first thing he goes for is his dad… even though his dad is usually still fast asleep from working late shifts. It’s so fun to see the two of them interact. Eric got some bubble wrap with a package… Sam really liked the bubble wrap! Another thing Sam has really gotten into lately is blowing raspberries. He gets the biggest kick out of blowing raspberries on people’s arms, cheeks, or whatever might be exposed. If I’m feeding him and he’s not tired I know that he’s done because he will stop eating and start pouncing on me to try and blow raspberries! We started feeding him some solids over the past couple of weeks. We started with bananas, which he really liked, and then went back to the rice cereal. However, he hadn’t been sleeping real well after introducing the rice cereal, so I’ve taken him off of solids for the last few days and he’s been doing better. Although, he’d also had a slight fever so the two might not be related, but I wanted to get him back to normal before pushing the envelope with the solids. One of the best discoveries with starting solids is actually finding one of his new favorite toys – baby spoons! He can be entertained for a good while just holding one of those rubber spoons, and chewing on it, and banging it on things. Who would have thought? I think that pretty much covers him right now. We’re taking him in for his 6 month check up in a couple of weeks so we’ll be sure to let you know how that goes and what his current stats are once that happens as well! It was a real blessing for our little family to be able to go attend the Oquirrh Mountain Temple dedicatory services today. While other events have preoccupied our time and efforts over the past few weeks, there have been none so important as the establishment of this house of prayer, healing, and worship to God. In this world of decadence and self-indulgence, I find great joy in the establishment of symbols and opportunities that promote service, love, and kindness to all human beings. During the course of the dedication, my mind was drawn to a very simple yet meaningful bit of wisdom. During his talk, President Thomas S. Monson mentioned the times that we try to set aside a place in our busy schedule to do temple work or service, we are often side-tracked by busy distractions that always seem to crop up at the same time. To paraphrase what the prophet said, we have many rooms in our homes in this day and age of comfort. We have bedrooms, TV rooms, offices, and this represent another piece of our lives and attentions. Where do we make room or space for the things that truly matter most? Where do we teach and set an example for our children as to do what is right? How do we show them what things are truly important? We need to make time for the temple, because that is where we find the apex of life’s greatest achievements. I know this to be true. Recent weeks have been a good example of President Monson’s lesson. In the course of unpacking during this week, I must have over-exerted myself somewhat and I was sick on Saturday and Sunday morning. Of course as a result, I did not really feel like going to the dedication, but with some more effort and resolve, I made the trip. I found that as I pushed onward toward that goal, I was able to do what needed to be done. It wasn’t as difficult as I had originally thought. This life is a wondrous miracle to me. I am so very grateful for family and friends that help us in so many ways, particularly with our recent move. It is hard for me to believe that so many opportunities would have been lost had I not made good choices prior to this moment, like going on a mission. Learning Chinese has opened many doors of opportunity, and my service helped my timing in finding the spouse that was perfect for me. On a lighter note, I wouldn’t even have all this neat artwork to decorate our new home with! :) I am truly blessed. Two Cheers for Tier II! Just a short update for this week before I go to bed, but we have two pieces of very exciting news. 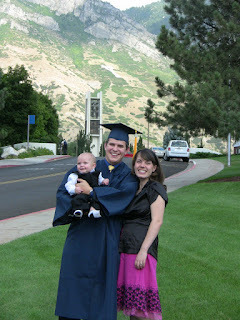 First and foremost, I am officially graduated now! It feels like a long time coming, but in all reality–especially when you consider the time I took out for my mission–I was still able to graduate with a degree in 4.5 years instead of the usual four! Not bad when you consider I changed majors from Computer Science to Information Systems about halfway through my education. Learning Chinese amongst all the wonderful experiences I had in Taiwan gave me a far greater education, in my opinion. And to top it off, it was also really nice to see the family come up and give us support. The second great piece of news is that I got the promotion at work! It is nice to finally be going in a more substantial direction that my education and experience qualifies me for. It’s not that I didn’t like my old jobs at the Network Operations Center or in Technical Support, but I feel like there is so much more I can offer. These jobs were important but very limited in the scope of my possible contributions. Here’s to the first step on our path toward the future! I promised you all that I would let you know what our family’s plans were, and I am happy to say that we have an answer now to what lies in our long-term future. After much deliberation (which you can read about in detail in Brittny’s entry in her family’s blog) we have decided to plan on moving to China. However, that doesn’t mean we currently have a specific plan or an official job offer to get us there. We just know it’s where we need to end up in the imminent future. So that meant we canceled the pending offer on the really nice house that we were about to commit to buying. Now we have about a week to find an apartment that rents out for short-term leases or month-to-month contracts. So this hectic stage of our life is not over quite yet. Sometimes I think God tests our resolve to do His will at the more inconvenient points in our lives. That way it is a true test of our actual character. It was particularly intriguing to me that we tried by every means possible prior to the point-of-no-return deadline on our house contract to gather data and find out at least a little more about our options so that we could make an informed decision. All of these avenues we pursued were dead ends, and I believe it was to let us make a decision by faith. It is good to know that we are headed in the right direction.